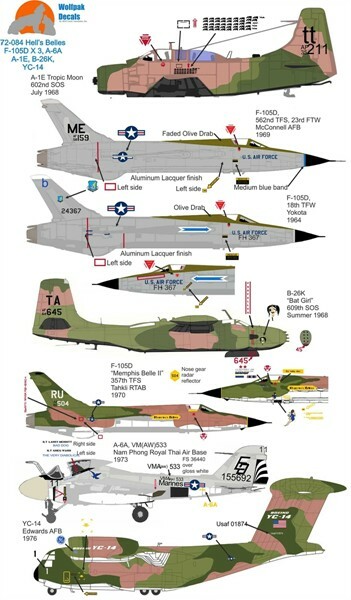 This latest Wolfpak Decals sheet contains markings for seven different airplanes, most of them from the Vietnam War era. We start off with a ‘tropic moon’ A-1E Skyraider from the 602 SOS in July of 1968. Tropic moon was a pod that allowed the aircraft to spot vehicle movement along the HoChiMinh Trail at night. The instruction sheet includes several photos of this pod so you can build one to add to your model. Next is the first of two F-105Ds, both of them in overall silver lacquer. The first is with the 562nd TFS, 23rd TFW when it was based at McConnell AFB in 1969. The second is an even more non-descript F-105D when based at Yokota AFB with the 18th TFW back in 1964, though it did have a blue arrow on each intake. From the 609th SOS in 1968 is a B-26K named ‘Bat Girl). This aircraft is in SEA camouflage with a black underside. The ‘belle’ of the sheet is the F-105D Memphis Belle II when with the 357 TFS in 1970. This aircraft sports a pair of MiG kills. Our lone non-USAF option is an A-6A from VMA(AW)-533 when based at Nam Phong in 1973. It is in the standard light gull grey over white. Finally, one of the two YC-14s when at Edwards AFB for tests in 1976. This in in standard SEA camo.